Caleb Johnson, a subcontractor of Northeast Turf of South Portland, smoothes freshly laid artificial turf at Fitzpatrick Stadium in Portland on Thursday, May 7. 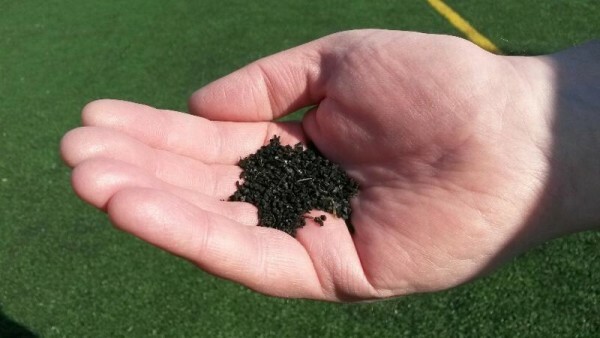 "Crumb rubber," like the pellets seen here at a Yarmouth High School field and used as infill in other area artificial-turf playing grounds, may be linked to cancer, some health experts warn. 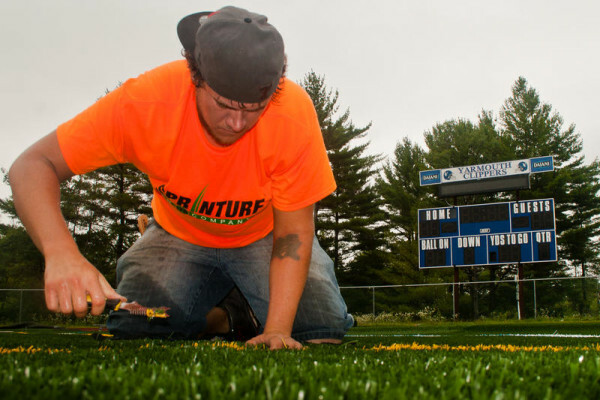 Tony Johnson, an employee of Georgia-based Sprinturf, puts the finishing touches on the soccer lines at the Yarmouth High School field. The field, which underwent a $1.5 million renovation over the summer, will be ready for student athletes by the start of the new school year. 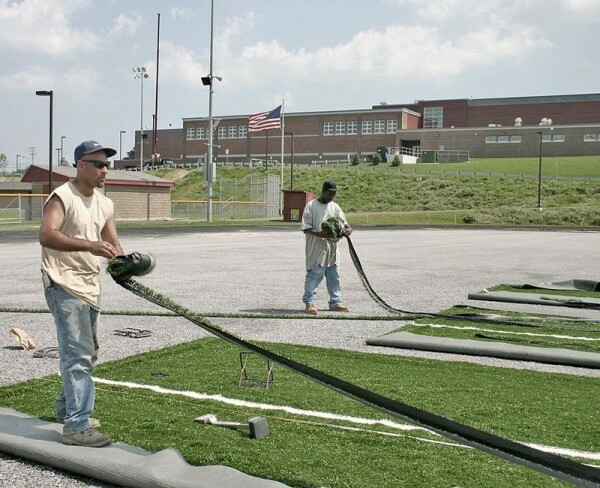 Employees of Sports Turf International, a Scarborough company, install the turf playing field at Scarborough High School in 2006. 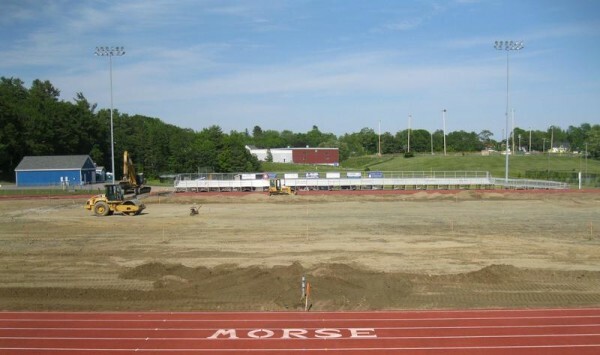 Construction of an artificial turf field at the Edward J. McMann Outdoor Athletic Complex at Morse High School in Bath in the summer of 2013. PORTLAND, Maine — Walking by the shuttered stands of Fitzpatrick Stadium, where final touches are now being made on a new artificial turf field, you might believe the adage: The grass really does grow greener on the other side of the fence. But some critics think recent alleged health concerns and questions about turf costs make playing grounds like Fitzpatrick, scheduled to re-open in less than a month, merely a field of dreams. In October, NBC News aired a report about Amy Griffin, a women’s soccer coach at the University of Washington, who had noticed a disturbing trend. Beginning in 2009, Griffin has compiled a list of 38 soccer players struck with cancer. All 38 had played on artificial turf, and 34 of them were goalies, who are constantly diving into the stuff. Neither Griffin nor NBC claimed there was a causal link between the turf and cancer. But the coincidence has been enough to fuel a simmering debate about the safety of crumb rubber, the tiny pellets of recycled car tires used as “infill” cushioning in nearly all of the country’s 11,000 artificial fields. The rubber’s composition is hard to pinpoint, but often includes toxic chemicals such as lead, other heavy metals and carbon black. Many of these are cancer-causing, and can be especially dangerous to children and teens, whose bodies are still developing. Nevertheless, Portland has gone ahead with plans to spend $835,000 to replace the artificial turf and surrounding running track at 6,000-seat Fitzpatrick. The new field, including dark-blue end zones and emblazoned with a Portland High School bulldog logo, is expected to open by June 20 for the state lacrosse championship and to be hosting football and soccer this fall, according to Ethan Owens, the city’s recreation and athletic facilities manager. Nine of the 17 high schools in The Forecaster’s coverage area now send their athletes to play on artificial turf fields. 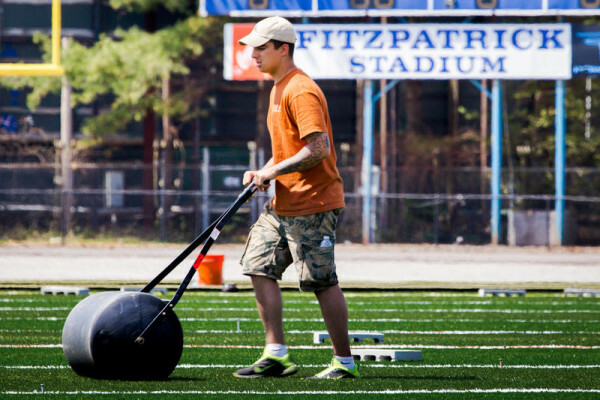 Two of those – Fitzpatrick and the Yarmouth High School varsity field – are replacements for man-made grass installed in 2001. At that time, the two were among the first artificial-turf playing surfaces in the state. Since then, turf-adopters have included Cape Elizabeth, Deering, Falmouth, Morse and Scarborough high schools, as well as The Hyde School in Bath and North Yarmouth Academy. And as at Fitzpatrick, Portland may double down by replacing the artificial turf at Deering’s Memorial Field in 2017, according to a city memo. But opinion is divided about the fake fields. School Administrative District 51 is now considering plans for a $1.6 million turf field at Greely High School in Cumberland. Yet the proposal has been under review for six months and it’s not clear when or if a decision will be made, according to Eliza Miller, chairwoman of the district’s Athletic Advisory Board. Regional School Unit 5 in 2013 rejected a similar proposal at Freeport High School. So did South Portland in 2010. Morse built its $580,000 artificial-turf field in 2013, but only after the Bath City Council overcame three years of opposition, including a public referendum that repealed an earlier approval. While most local opposition has focused on the high up-front costs of installing artificial turf, concern about the health effects of crumb rubber has prompted other regions to reconsider their use of turf. Kennedy Catholic High School in suburban Seattle decided not to use crumb-rubber infill after the school principal viewed the NBC report. Last month, voters in Concord, Massachusetts, nearly passed a proposed two-year moratorium on the town’s use of artificial turf. The Los Angeles Unified School District and the New York City Parks Department both stopped construction of new fields with crumb rubber several years ago. The California legislature is now considering banning the use of state funds for such fields. And some municipalities have required chemical testing of their artificial-turf fields before players set foot on them. He said the city’s request for the turf replacement took a year to draft, and required the field to meet high industry standards for safety factors such as shock absorbency. But there was no standard set for chemical safety and no requirement for study or testing. Like Owens, she cited scientific studies touting the safety of artificial turf. Fact sheets published by the turf industry cite dozens of them. But some health experts claim the studies are too limited to be useful, examining only a small number of fields and the effects of only a small number of chemicals. And regardless of the scientific debate, these experts say, there has been no study of turf’s long-term effects, simply because today’s fields haven’t been around very long. Artificial turf dates to 1966, when the first brand, AstroTurf – basically, short-pile nylon carpeting laid over concrete – was installed at the Houston Astros’ indoor baseball stadium. But crumb rubber infill has been used less than 20 years. Reflecting the uncertainty, both the federal Environmental Protection Agency and the Consumer Product Safety Commission have recently back-pedaled from claims they made more than five years ago that artificial turf is safe. Local sports experts are keeping a close watch on the potential cancer risks of turf. “There certainly seems to be some sort of a connection. Maybe it’s worth a second look, to continue the research,” said Matt Gerken, head athletic trainer at the University of Southern Maine, which installed turf in 2011. “But where do you draw the line? Gerken, who served as trainer to the USM women’s soccer team for 15 years, speculated whether crumb rubber infill could be inhaled, ingested or ground into an open cut or abrasion. At SAD 51, Miller said, “We’ve looked at the reports, and are investigating options for infill” on the proposed Greely field. School Board members and Cumberland residents have already asked questions about artificial turf’s safety, she said. Back at Fitzpatrick, Owens doesn’t dismiss the cancer claims entirely. Artificial turf provides a more uniform playing surface that is easier on athletes’ joints, he adds. And the high price tag of the turf is offset by maintenance that is far less costly than a natural grass field’s. Still, municipalities such as Montgomery County, Maryland, estimate that the need to replace turf every eight years or so makes the long-term costs of both field types about the same. Owens believes the bigger advantage is the heavy use turf can take. Fitzpatrick could only accommodate about 140 hours of use annually when the field was grass; in its last season of use, the turf field hosted 3,500 hours of play. Last week, as workers prepared to lay down the first rolls of new turf, a visitor wondered when the project would be finished.